At the beginning of the 20th century—the average human lifespan was only 47 years—and people with chronic conditions lived in institutions. Obviously, people are living longer today. The average lifespan has increased to 76, largely due to healthier living, better medicine, and vaccines and sanitation that have virtually eliminated many deadly infectious diseases. Nearly 80% of the population now lives past the age of 65. By 2020, the Census Bureau estimates that 7 to 8 million people will be over age 85 and 214,000 will be over age 100. These demographic changes result in a population that is older and with more disabling conditions than many realize and these trends continue. The limitations imposed by products and environments designed and built without regard to the needs and rights of all people are significant but often unrecognized. It is a long known fact that the physical environment has an effect on the healing process, both positive and negative. Knowing this, it is important when releasing a patient to heal at home to consider the home as a component of the continuum of care. Contrary to what was believed to be true by Winston Churchill, we must adapt our homes to our needs rather than us adapting to them. Promoting independence not only has psychological effects on a person’s self esteem, but allows them to safely move around their environment. Unfortunately, in the past, homes were not designed to accommodate illness, the normal processes of aging and changing abilities. Mobility and physical impairments can be either in-born or an acquired with age problem. It could also be the effect of a disease. People who have a broken bone also fall into this category of disability. Vision disability affects hundreds of thousands of people suffering from minor to various serious visual impairments. These injuries can also result into some serious problems or diseases like blindness and ocular trauma, to name a few. Some of the common vision impairments include scratched cornea, scratches on the sclera, diabetes related eye conditions, dry eyes, and corneal graft. Hearing disabilities include people that are completely or partially deaf. Deafness can be evident at birth or occur later in life from several biologic causes: for example, Meningitis can damage the auditory nerve or the cochlea. Cognitive disabilities are the kind of impairments present in people who are suffering from dyslexia and various other learning difficulties and include speech disorders. Invisible disabilities are disabilities that are not immediately apparent to others. It is estimated that 10% of people in the U.S. have a medical condition considered a type of invisible disability. Coupled with the special needs of the healing process, being able to fully function at home is as important as the medication prescribed. Familiar surroundings, family interaction, and the fostering of independence are believed to accelerate the healing process. 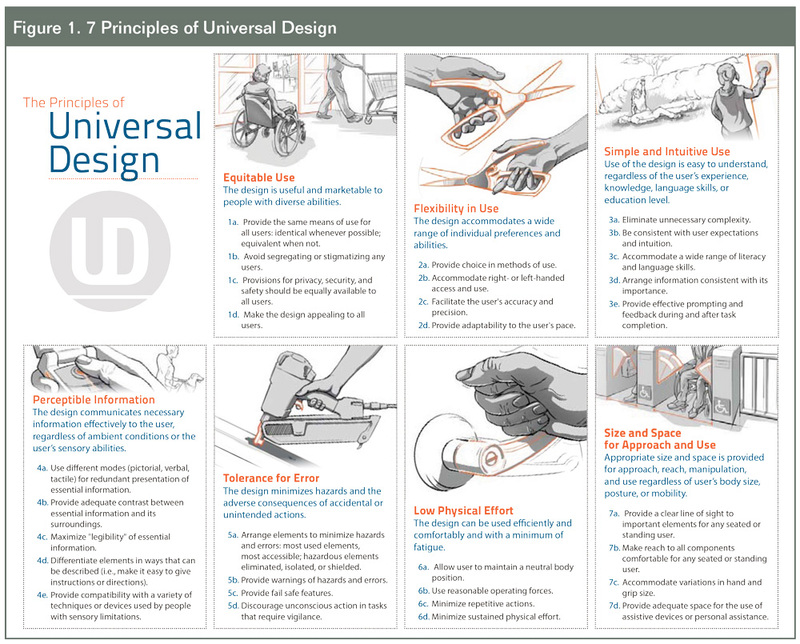 Ideally, all home environments should be originally planned with the 7 principles of Universal Design (See Figure 1). All homes would then be usable by all people, to the greatest extent possible, without the need for adaptation or specialized design (Universal Design as defined by R. Mace ). Because these 7 principles of Universal Design are not common practice in the home construction industry, there are many simple home modifications that can increase the safety and convenience of any home. By implementing some of these solutions to daily living challenges, your patients with chronic wounds can maintain independence with safety and confidence. 1) Safety and accessibility are paramount in the home of a patient with chronic wounds. A clean, textured gently sloping pathway, which leads to and from the curb, makes maneuvering effortless for the patient, their caregivers, and all who visit. A well-lit, covered entrance will also welcome everyone, including the patient with the chronic wound, into the home. 2) All living spaces should be clear of clutter with adequate maneuvering space. Since falls are a concern, all furniture with sharp edges should be removed or protected to prevent injuries. A simple, easily installed corner protector, like those used to childproof a home, is a low cost solution to this challenge. Flooring should be stable, firmly attached and nonslip. All throw rugs should be removed. Because many patients with chronic wounds are unstable on their feet, they have a tendency to hold on to furniture or to use the wall as a balancing instrument. Therefore, care should be given to assess the hazards. Artwork must be firmly attached or removed if the possibility exists that it might crash to the ground and cause a dangerous situation. Eliminate extension cords extended across empty spaces and never run cords under carpeting. Seating should be firm and not easily tipped over. Armchairs are preferred since they allow the individual to easily rise and get their balance. Lighting should be adequate and without glare. Window treatments should be easy to reach and adjust. 3) Kitchens present other dangers and should be carefully evaluated to minimize injury and to encourage good nutrition and socialization. As with all living spaces, flooring should be stable and throw rugs should be removed. Whenever possible, ranges should have controls on the front to prevent reaching over hot burners. Items used everyday should be in a convenient location to prevent any extra effort in reaching or stretching. A sturdy chair should be available to prevent fatigue. Chairs on rolling casters and lightweight pedestal tables should be avoided. Quality lighting over work surfaces is essential to prevent injuries or the use of an inappropriate product. One patient used a well-known pine scented cleaner instead of cooking oil because the bottles and color of the products were similar. For the sightimpaired individual, a contrasting band of color or a textured strip on the edge of counter tops will give a visual cue between surfaces. 4) Bathroom modifications can be more extensive and possibly the most expensive, but are the most important in the home. The ability to function independently is so important to the healing process. 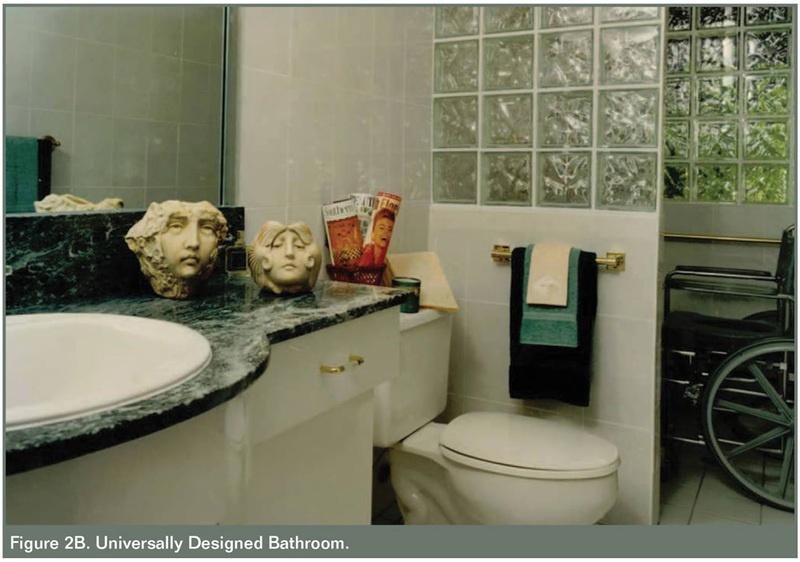 The ideal bathroom would be large enough to accommodate a wheelchair, have a wheel-in shower stall, a comfort height toilet, and an opening under the vanity for grooming from a seated position (See Figures 2A and 2B). When this is not financially or physically feasible, a few simple features can make the room more functional for short term healing. Improved bathroom safety and convenience can be achieved with the installation of a raised toilet seat designed to increase seat height and assist those with bending or sitting difficulties. These seats fit on top of the toilet bowl so care should be taken to assure that they are properly installed and maintained. 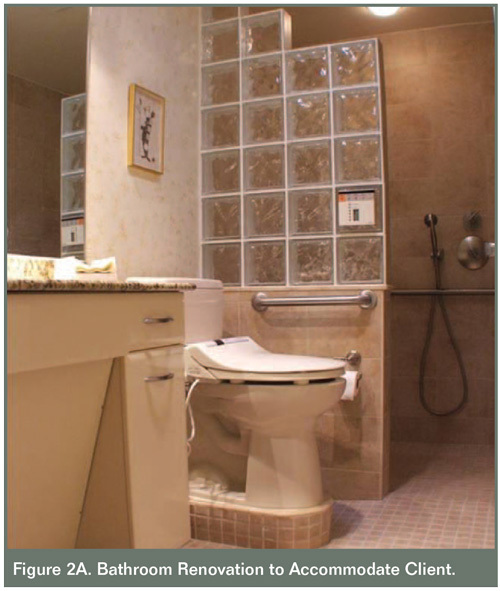 A sturdy shower seat that allows easy transferring can turn the most inaccessible bathtub into a seated shower. Grab bars are a must and, again, should be properly installed to prevent them from being pulled out of the wall. Many a bathroom accident was caused by using a towel bar or toilet paper holder as a grab bar. Whether using these simple modifications or completely renovating the bathroom, it is important to periodically evaluate the work to be sure it is properly maintained and functioning as planned for the patient. 5) Outdoor spaces should also be considered when sending your patient home to heal. There are numerous benefits for being outdoors among carefully planned landscaping. As with the entrance into the home, a clean, textured gently sloping pathway leading around the area should be well lit and provide study seating. Raised garden boxes can also provide a therapeutic activity that helps give a feeling of accomplishment. 6) A home interior can aid in promoting well-being and health. There are so many elements that individually or combined can have a positive effect on the healing process. The healthiest of homes are furnished with natural materials and have the proper mix of natural and artificial lighting. The colors chosen also have an impact on the occupants. Nerves can be calmed, appetite stimulated, or activity encouraged, all with the use of proper colors. 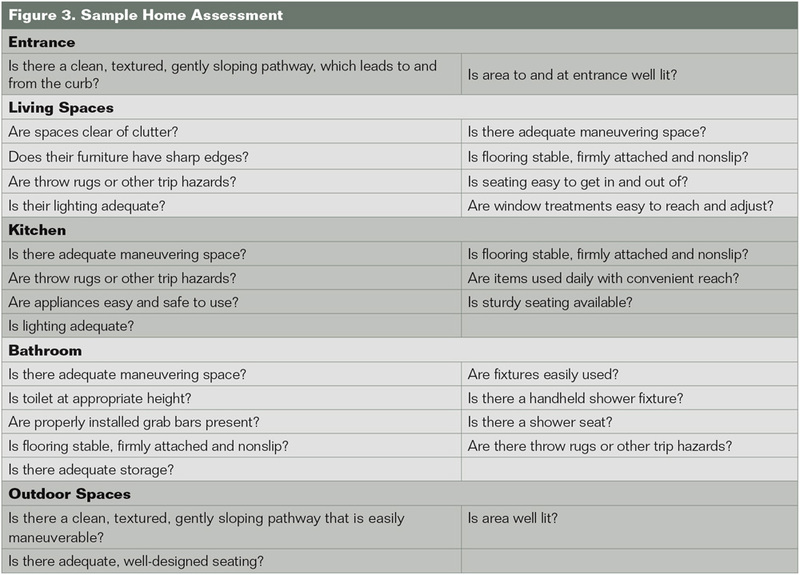 7) The first step in modifying the home of a patient with one or more chronic wounds is to conduct the Home Assessment (See Figure 3). 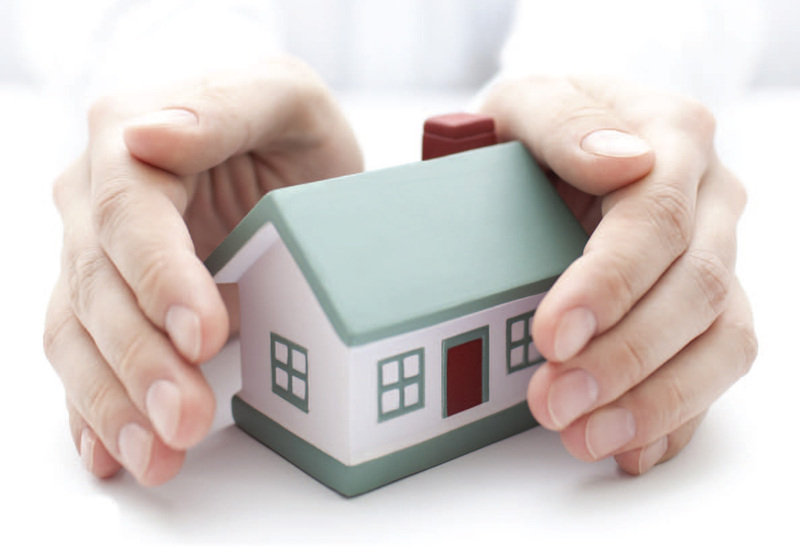 Evaluating current conditions and removing hazards will begin the healing process of the home. Just as patients with chronic wounds should seek care from wound care professionals, families that need to modify their homes for family members with chronic wounds and/or other disabilities, should partner with a design professional who can do a more extensive needs-evaluation and present a plan that will accommodate individuals today and beyond. Shelley Siegel, FASID, is founder and president of Universal Design & Education Network, the Healthcare and Continuing Education division of Siegel Design Group, Inc. Shelley holds a degree in Interior Design, is licensed by the State of Florida, and is NCIDQ qualified. Shelley also completed a Masters Degree in Gerontology at Nova Southeastern University. Believing that encouraging independence in an aesthically pleasing environment can add to the quality of life, Ms. Siegel is dedicated to bringing universal design concepts into the home, workplace, hospitality, and healthcare environment. Knowing that a properly planned environment is not only safer, but promotes healing, Shelley is careful to include design elements which accommodate most of life’s changes including the normal processes of aging. She has authored numerous articles on barrier-free and universal design and was appointed by Governor Chiles to the Florida Coordinating Council on the Americans with Disabilities (FCCADA) and served on the Florida Department of Cultural Affairs ADA Advisory Board. She was a member of the advisory panel for the National Universal Design Program developed by the American Society of Interior Designers (ASID) in an effort to involve more Designer Professionals in the process of Universal Design. Shelley is a past President of the Florida South Chapter of ASID. She sits on the NFPA Building Code 5000 Building Systems Committee where she chaired the accessibility task force and is on Life Codes 101 Furnishings and Contents committee. She is the past President of the Interior Design Associations Foundation (IDAF). Shelley served as 2002-2003 Chair of the A.S.I.D. National Education and Training Advisory Council (ETAC) and was a member of the NCIDQ Analysis of the Profession Panel of Experts. She also served on the 2003-2004 ASID National Codes and Legislative Action Council (CLAC). Shelley Siegel is a winner of the prestigious ASID Medalist Award for her outstanding contribution to the Interior Design Industry in South Florida and was inducted into the ASID National 2004 College of Fellows, the highest honor the Society bestows on its members. In 2010, Shelley was inducted into the American Society of Interior Designers Florida South Chapter’s Hall of Fame. Shelley Siegel lectures nationally to design and construction professionals on the ADA, building codes impacting design professionals, hospitality design, senior living facilities, daycare center design, designing for special needs children, designing for changing needs within a residential setting, green design in the healthcare environment, lighting and color, professional practice and ethics, EPA’s lead-safe workshop, and the design professional as an expert witness.